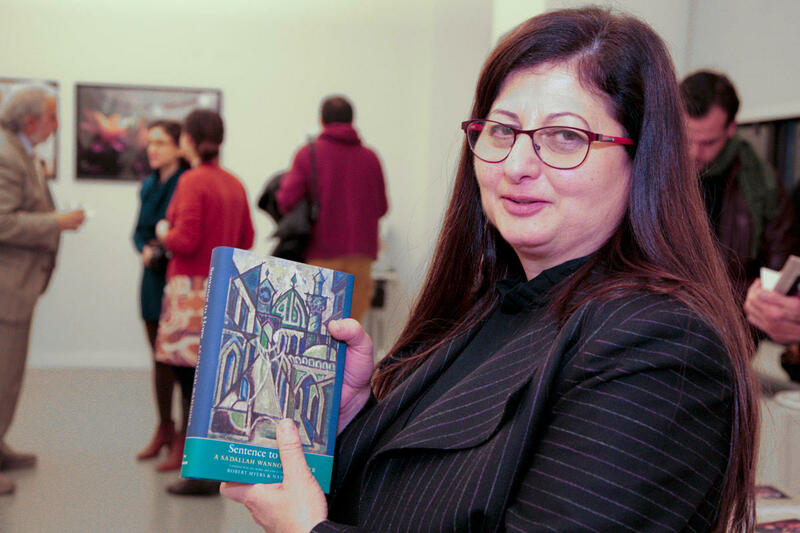 The New York Headquarters and Academic Center hosted the launch of two groundbreaking books co-written by LAU scholar. Dr. Saab explained the complexities of language she and Dr. Myers faced in translating jokes from Arabic into English. 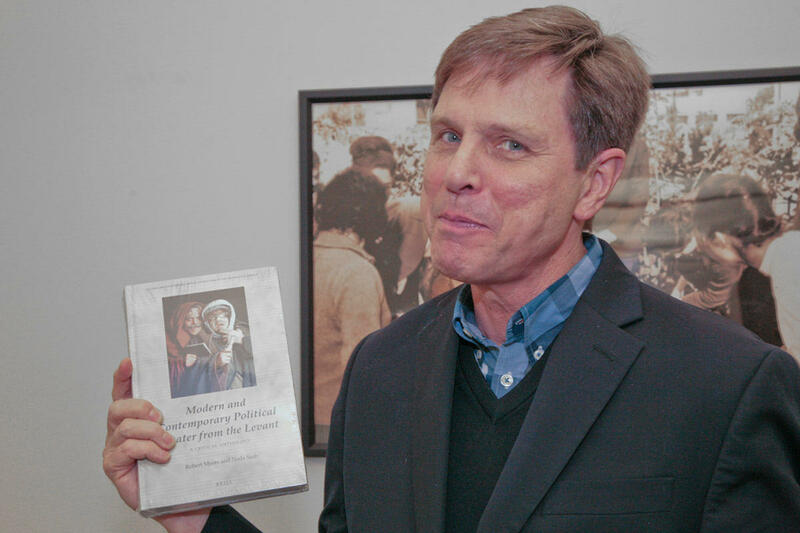 Dr. Myers holding up the translators’ publication Modern and Contemporary Political Theater from the Levant: A Critical Anthology. Dr. Saab proudly displays the book that made the New York Times’ roundup of important works from around the world in 2019. 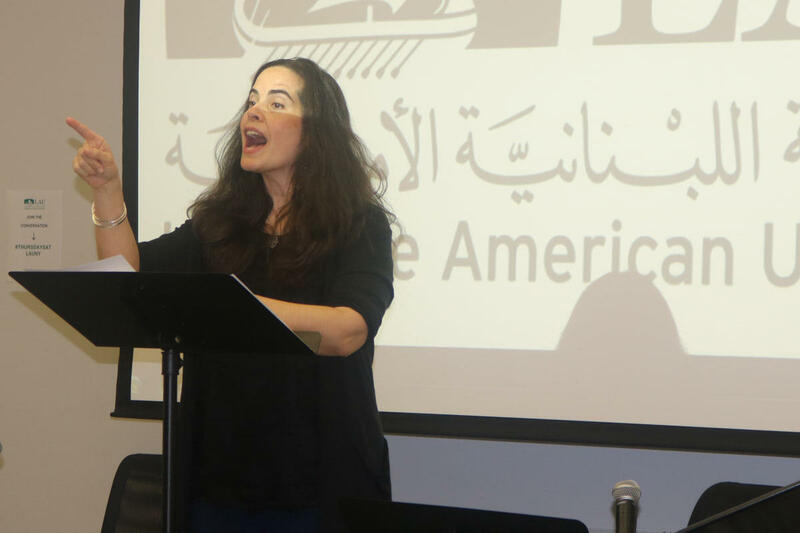 Lebanese-American writer and performer Leila Buck gave a stirring performance of The Corpse and Kissinger, an autobiographical text by Palestinian playwright Ra’ida Taha. Over a decade of collaborative work between LAU’s Nada Saab and Robert Myers of the American University of Beirut (AUB) has culminated in the production of two major publications. The scholars have been friends for over 12 years and have been working together to research, translate and produce seminal dramatic works from the Levant. They gathered recently at LAU’s New York Headquarters and Academic Center (LAU NY) to launch two groundbreaking books they have collaborated on. Dr. Saab is an associate professor of Arabic literature and director of LAU’s Arabic language and culture program SINARC. Dr. Myers is a professor of English, director of both AUB’s Alwaleed Center for American Studies, and the Theater Initiative. Together they have authored several studies on modern Arabic drama and translated works by dramatists such as Issam Mahfouz, Sa’dallah Wannous, Muhammad al-Maghut, Ra’ida Taha and Jawad al-Assadi. The event at LAU NY celebrated the release of two major publications from the collaborators. Modern and Contemporary Political Theater from the Levant: A Critical Anthology, published by Brill in November 2018, traces the recent history of political theater in the region through translations of significant playwrights and critical essays about their work. Sentence to Hope: A Sa’dallah Wannous Reader, published by Yale University Press in March 2019, is the first major English language collection combining plays and other writings by Syrian playwright Sa’dallah Wannous, one of the most important dramatists and social critics from the Arab world in the last century. The book was listed in the New York Times’ roundup of important works from around the world in 2019. 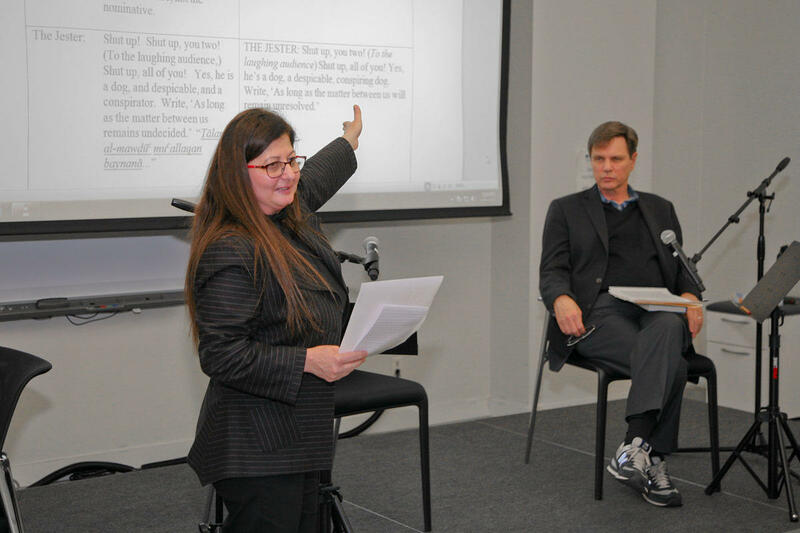 During the event, Dr. Saab explained that the scholars’ collaboration actually began 12 years ago when she and Dr. Myers, himself a published playwright, first contemplated a translation of Iraqi playwright Jawad al-Assadi’s work Baghdadi Bath. The play tells the story of the American invasion of Iraq from the point of view of two Iraqi brothers, one enriched and the other impoverished by the American occupation. Drs. Saab and Myers highlighted that they regard the plays they have translated as living works meant for the stage. Because the theatrical works in both volumes are contemporary, the translators often had the opportunity to see them performed at different venues, in various languages and with diverse casts, before attempting their own translations. For her part, Dr. Saab explained the complexities of language the two faced, displaying different choices of wording from a passage on an overhead projector so the audience could grasp the difficulty of translating jokes from Arabic into English. “When you translate a play, the audience is different, their cultural background is different, and you are required to translate this text while maintaining its literary and linguistic value, and in the form with which the audience can interact,” she said. The scholars also spoke of the fruitful collaboration between LAU and AUB, allowing the institutions to come together to create something greater than either university could do separately. In the second half of the evening, New York-based actors performed readings of selected scenes from plays from each publication, starting with a scene from al-Assadi’s Baghdadi Bath, which they had previously presented in a full production at La Mama Experimental Theater Club in the East Village. A reading of Rituals and Signs of Transformations by Sa’dallah Wannous, produced in Beirut using Drs. Saab and Myers’ translation and now published in Sentence to Hope, came next. Finally, Lebanese-American writer and performer Leila Buck gave a stirring performance of The Corpse and Kissinger, an autobiographical text by Palestinian playwright Ra’ida Taha. The audience was left with a lasting impression of the power and importance of these Levantine works, now accessible in English to a much wider audience thanks to the scholarship of Drs. Saab and Myers. Another book launch is scheduled for April 15 on LAU Beirut campus, which will include presentations by Drs. Saab and Myers, and performances.